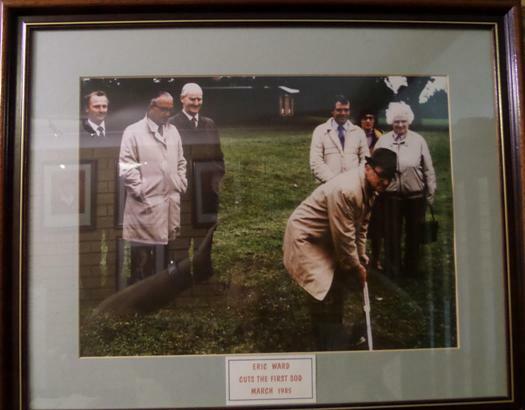 The club for Northampton and District Indoor Bowling Association was officially opened in January 1986 but how and when did it all begin? Well it actually all started in August 1981 when a letter was posted in the local paper stressing the need for an indoor bowling club for Northampton and its surrounding villages. From this a steering committee was formed, the first chairman elected, monthly meetings held and sufficient interest generated to enable the association to negotiate with various corporate bodies (mainly the Borough Council). The Council agreed a suitable site would be found so long as there was sufficient support and financial backing. Several sites were discussed and on September 7th 1983 it was agreed that the best site would be that offered by the Parks Committee, Kingsthorpe Recreation Ground. A meeting was held at the Guildhall and 250 people attended. A Financial Committee was formed and it was thought that the project would cost approximately £400.000. An appeal was made and over 1500 application forms to join the club were sent out to other outdoor bowling clubs and local people in Northampton and its surrounding villages. Membership fees were set, with the joining fee of £10.00 and the annual subscription of £15.00. We received £10,500 but the Council had requested £50,000 to show the project was supported enough for them to continue supporting it. How would the club get off the ground with such huge a shortfall? At this point in time Northampton was probably the only town of its size in Britain without an indoor bowling club. Wellingborough had a six rink centre, Kettering a four rink centre and Brackley a three rink centre. By 1984, 600 members had staked £47,000 towards the project and 5 year loans had been invited from members with a minimum loan of £50. After much more determination by the committee and the members, £50,000 was eventually raised with a promise of a Grant of £35,000 from the East Midlands Sports Council, £1,000 from The Development Council and £10,000 from the County Council who also secured for the club a loan from Lloyds Bank of £26,000. The structure of the association was revamped and prospective members paid an additional £50-00 to the club as an interest free loan together with their joining fee. The loan would be repaid as soon as funds were available. Local business merchants, outdoor bowling clubs and The Dolphin Club for the Blind all made loans or donations. Ladies outdoor bowling clubs were also becoming interested and several coffee mornings were held to raise yet more funds towards the project. Eventually and after much effort, persistence and heartache work began on the site for Northampton and District Indoor Bowling Association. The first ‘sod’ was cut by the first chairman of the club, Eric Ward in June 1985. The club was officially opened in January 1986. After the first sod was cut, then the really hard work began! The building was open but it was just like an old aircraft Hanger, everything painted grey. The Chairs were all second hand and we did not have an enclosed restaurant area and when chips were being served for the match meal, the players on Rinks 1- 2 and 3 went home smelling of cooking. The gas stove was bought second hand and worked when it felt in the mood. All of the members had to take it in turns to do their bit, helping with cleaning, bar duty and match meals. The volunteer Green Stewards looked after the green and collected in any monies. All this hard work and commitment was done on a volunteer basis, but these members knew they were building a fantastic indoor bowling club. The Social Team organised events to bring money into the club, fancy dress, bingo, fun bowls, sing-a-longs and bank holiday functions. A new 8 rink green had been proposed, almost 5 years ago at an estimated cost of £400,000. The ‘Escabowl’ bowling carpet itself costing approximately £21,000. As with all bowling clubs in the 80s there was a division between the Ladies and the Men, and two different sections existed. The first match played by the Men was against Abington Outdoor Bowls Club. Northampton and District Indoor Bowling Association won by 29 shots. Both the Men and the Ladies English Indoor Bowling Associations have held their Nationals Finals at the club. In march of this year 2014 the E.I.B.A. Ltd nationals will have been held here for the past 12 years. Information is given out by the Local Press and Radio on these events, bringing the sport of indoor bowls and Northampton and District Indoor Bowling Association to the attention of hundreds of people. If you have any queries about the club, would like to come and see us, or for further information about memberships please call 01604 721200. It was the Team Spirit of every member that kept us going in those early days and that Team Spirit is still with us today.